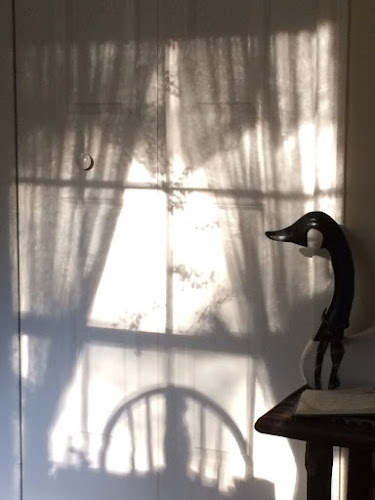 Sitting in my big comfy rocker the other afternoon while paying bills, I looked up and spotted this scene on the wall created by the late afternoon sun. I snapped a quick pic with the cell phone. It wasn't long after that I powered down the laptop. how very nice. so peaceful. How beautiful is that and enough to inspire anyone to take a brain break. this is the type sun painting that gives me joy... every day i wait to see what the sun will do in the house and it changes daily. your shadow shot is gorgeous. the goose makes it even better. The chair makes a great shadow! How lovely! A perfectly beautiful, tempting picture. I love this! A really beautiful, dreamy photograph. A lovely moment you captured here. Looks so peaceful and poetic ... These moments ~ to notice and see the beauty around us everywhere! Very pretty & so peaceful! For whatever reason this reminds me of Sunday family visits of long ago. JP, this is a great shot. The black, white and greys is wonderful complement to the goose. Sylvia D.